On occasions you may want to export your products from Veeqo to either access useful product information in bulk, or perform edits to your products. 2. 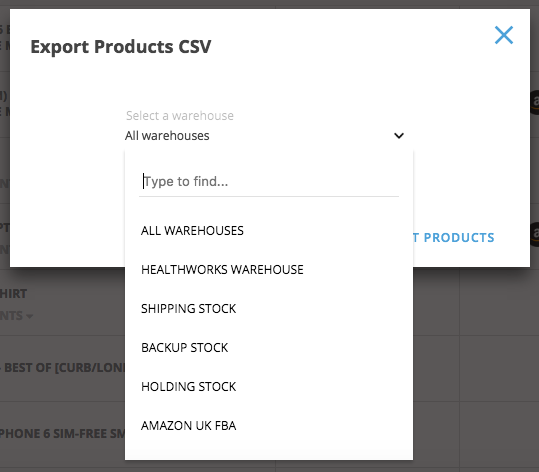 A pop-up window will then display which will ask you which warehouse you would like to export your products from. This is in a drop down format. You can either select the warehouse you are wanting or you can select 'All warehouses' if you wish. 3. 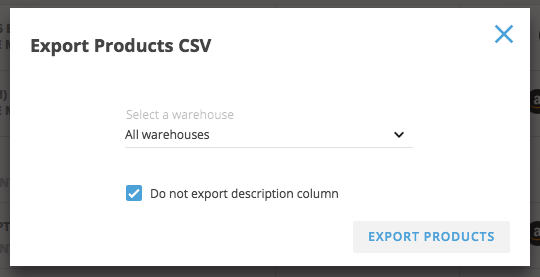 When you have selected the warehouse you wish to export your products from, ensure that you tick Do Not Export Description Column. We recommend selecting this option as some products contain HTML code that can cause issues when re-importing back into Veeqo. Once you have done this, click on the Export Products button. 4. The CSV file will then start to be generated in the notification bell which is located at the top right hand corner of your Veeqo account. If you have a large amount of products/variants it can take a while for this file to generate. If you are unable to download this file after 1 hour please contact helpme@veeqo.com. If you wish to make changes to the downloaded file and upload it back into Veeqo we recommend you check out the Update/Edit Products In Bulk guide first.